Florida-based SCT has been tuning on electronically-controlled cars since 2003. Since then, technology has advanced not only in the capabilities of the ECUs that reside under the panels of our autos, but also in the way that we interface with them and make them more to our liking. Today’s tuning tools are more user-friendly, and much more capable than units sold just a few years ago. 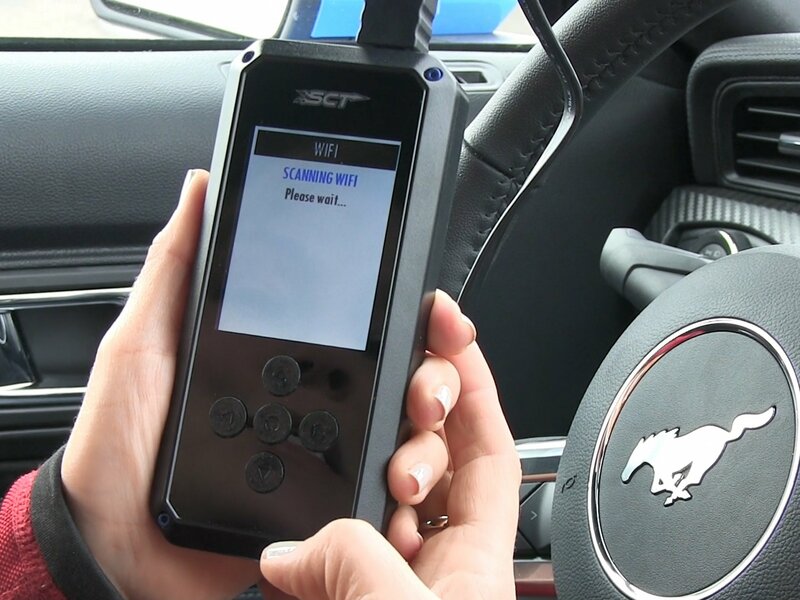 Today’s tuners also serve as diagnostic tools, real-time data displays and now, thanks to SCT, they are also updatable via the cloud service through a WiFi connection. SCT invited us to check out their latest offerings during a media day at the Palm Beach International Raceway in Jupiter, Florida. SCT offers tuning capabilities on several different manufacturer’s cars and trucks. They had several different vehicles for us to try. We spent most of our time in the Ford Mustang and the Ranger. Many Ford enthusiasts will remember fondly the SCT X4 Performance Programmer. This unit has been one of SCT’s best sellers to date, and has been a favorite of Mustang and Ford enthusiasts for years. Building upon a solid foundation they had in the X4 Performance Programmer, SCT has engineered the SCT BDX and GTX tuners to bring more capabilities, a broader application portfolio and even more data enhancements to the enthusiast. To top it off, both the BDX and GTX programmers are cloud-capable and can be updated to the latest programming for your particular Ford simply through any available WiFi connection. Whether you’re searching for a tuner with plug-and-play capabilities for your Mustang or your Ford pickup, the SCT BDX Performance Programmer can unleash hidden performance in your 2.3L Ecoboost, as well as the brawny 5.0L V8. The BDX Performance Programmer utilizes hand-held ease of use and comes with tunes designed to unlock your vehicle’s true potential. Each tune is street-tested and proven on the dyno by SCT’s expert calibrators. And thanks to SCT’s WiFi-capability, you’ll be able to send and receive tunes over the cloud from any available WiFi point, anywhere in the world. The BDX connects directly to available WiFi and automatically searches for the vehicle's configuration, as well as any available updates. Once uploaded, the little hand-held device opens up a grand array of parameters that the end-user can modify for their application. The BDX can store up to 20 tune files, so you can easily store separate files for economy, daily-driving or for those moments when you bring out the good gas. Custom tuning for your specific application is available from one of SCT’s thousands of custom tune dealers. BDX also stores your vehicle’s factory tune, so you can restore it back to factory settings at any point. The BDX connects directly to the vehicle via a cable. This allows the BDX to access not only the ECU for reprogramming, but also various sensors for data logging and diagnostics. Beyond the performance benefits, BDX is also a powerful tool in diagnosing trouble codes and monitoring engine parameters in real-time. BDX can datalog the entire spectrum of operating data, to be viewed later for tuning or diagnostic purposes. Users can also record their vehicle’s performance and play it back later with SCT’s free LiveLink software. User-adjustable features in the BDX allows enthusiasts to adjust the engine’s global spark timing, fuel injector sizing, fan control, and modifying the maximum engine RPM and vehicle speed. Further adjustments for tire sizing, larger throttle body, and throttle sensitivity are available within the menus, as well as modification of the vehicle’s transmission shift points and firmness. There is a lot of data to consider when dealing with performance driving and having a larger, well-lit display is sometimes the best way to ingest all the information that your ride is providing. SCT’s GTX Performance Tuner And Monitor is just the right tool for the job. SCT’s GTX has all the same capabilities as their BDX tuner, but also brings a 5-inch, capacitive glass touch-screen that allows enthusiasts to see, modify and interact with the touch of a finger. No fiddling for unlit buttons, and with the additional magnetic window mount, the GTX can easily be viewed without deviating your eyes from the road. The GTX connects to the vehicle through SCT's proprietary Vehicle Interface Module (VIM). There is a handy window mount and the GTX utilizes a convenient magnetic connector so that the 5-inch screen can be removed for storage. The unique mounting of the GTX allows for the display to be removed when not in use or for out-of-sight storage for safe keeping. The display is highly-customizable to view the information that is important to you, and full data logs can be performed to review all the available data at a later date. Enthusiasts can further customize their SCT GTX by adding additional sensors and linking to the GTX via the integrated FireWire input. The GTX's touchscreen is configurable. There are several layout options available and even the information shown on the screen is selectable. While data logging, all information is recorded, then the user can choose which information to view while re-playing. The folks at SCT dyno test each tune to ensure that the customer gets the value and performance they are seeking. On a 2019 Ford 2.3L EcoBoost Mustang, SCT’s calibrationistas massaged another 47 horsepower and 58 lb-ft of torque out of the little pony. The big showing of the bunch was the 2019 Ford F-150 with the 3.5L EcoBoost V6. With 93-octane fuel and a tune, this six-cylinder powerhouse punched out a peak gain of another 126 horsepower over the stock tune, with an additional 115 lb-ft of torque! We took a few laps in the 2.3L EcoBoost Ranger and we could definitely feel the difference. The boost came on strong at lower revs and carried through to redline. Matt's 2018 F-150 with a modified 5.0L V8 holds the title as the fastest naturally-aspirated crew cab. We spoke with Matt Alderman of ID Motorsports in Holly Hill, Florida about his experience using SCT’s latest offerings in tuners. He currently holds the record for the fastest naturally-aspirated crew cab with his 2018 5.0L Ford F-150. While naturally-aspirated, his truck is far from stock. Matt has installed a GT350/Bullitt-style manifold, an 87mm throttle body and a set of Kooks 1 ¾-inch long-tube headers. His truck currently runs 12.2s in the quarter-mile at 112 miles-per-hour. We asked Matt about tuning his truck with the SCT tuners. He replied that by optimizing the Variable Cam Timing for both intake and exhaust, and tweaking the drive-by-wire, he was able to build a custom tune to adapt to the current modifications. In the end, he shaved off about 2 seconds and added 14 mph on the dragstrip while still retaining his truck’s drivability. If you’re looking for increased performance from your Ford, whether slightly greater than stock or all-out modified, SCT tuners are a great way to get your vehicle’s potential, and your expectations on the same plane. Whether wild or mild, and daily or on special occasions, the SCT BDX and GTX performance tuners have the capabilities and ease of use to get you well on your way to a more enjoyable, higher-performing Ford vehicle. We’ll only send you awesome content. We promise.